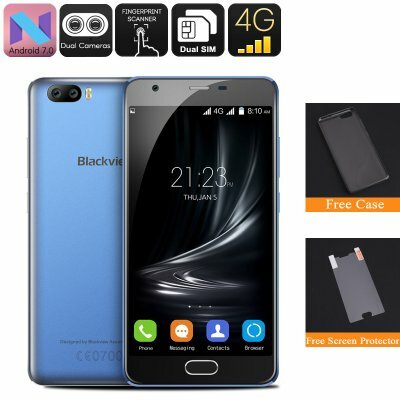 Successfully Added HK Warehouse Blackview A9 Pro Android Phone - Android 7.0, 4G, Dual Rear Camera, Quad Core CPU, 2GB RAM, 5 Inch Screen (Blue) to your Shopping Cart. Blackview is known for the affordable phones with striking features and the Blackview A9 Pro follows that trend. Coming with a 5-inch display, quad-core CPU, 2GB RAM and Android 7.0 OS this cheap phone is great value for your money. The Blackview A9 Pro with its 5 display 2.5 D curved glass and tough metal chassis feels and looks every bit a quality phone. With this attention to detail and sound craftsmanship, the A9 has the looks and feel to rival bigger named brands. With 720P the screen serves up a rich viewing experience with good contrast and nice color depth. At 294ppi you get a sharp image that will make your games and movies really come to life. Beneath the stylish exterior is a quad-core SoC, 2GB of RAM and a Mali GPU that combine for a smooth performance whether you streaming video, playing games or multitasking. This Android phone comes with 16GB of internal memory and the micro-SD card lets you add a further 32GB of storage. This is sure to be enough for all your needs and will support hours of video, audio and gaming entertainment. Running on the Android Nougat OS the Blackview A9 Pro mobile phone has the most advanced features to date. You'll have a friendly interface with more intuitive menu options and an impressive personal assistant in the form of "OK Google". Like many new phones, the A9 Pro has been blessed with a dual rear camera setup. Using Samsung sensors ensures you'll be able to snap great quality shots that will impress with their vivid details and rich colors. The Blackview A9 Pro Android smartphone comes with 12 months warranty, brought to you by the leader in electronic devices as well as wholesale Android phones and cell phone accessories..